The Rose Bowl in Pasadena, California will host the 2010 BCS National Championship Game on Thursday, January 7th, 2010. The game is schedule to kickoff at 5:00pm Pacific Time. Below is a stadium seating chart of the Rose Bowl. 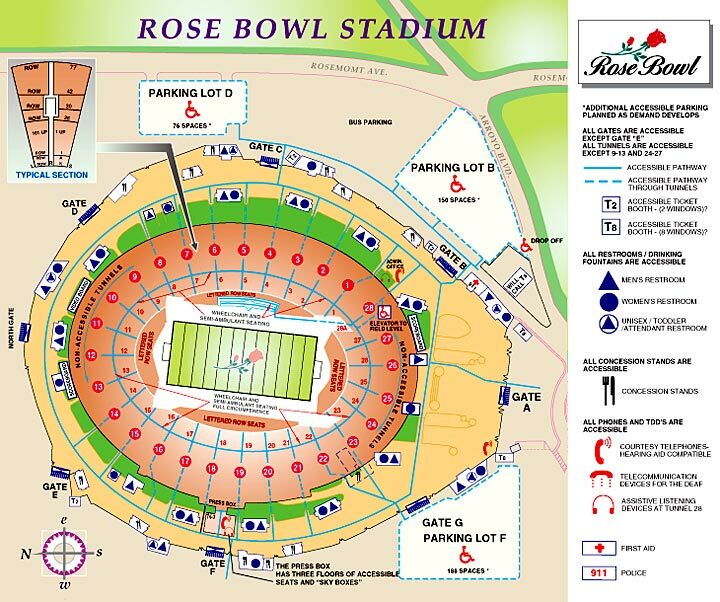 There are 28 sections in the Rose Bowl, each has approximately 77 rows. The Rose Bowl seats over 90,000 people for a college football game, the capacity for the BCS Championship Game will be near 100,000. The Texas Longhorns bench will be in-front of sections 4-5. The Alabama Crimson Tide bench will be in-front of sectsion 18-19. Here is a link to driving directions to the Rose Bowl in Pasadena, California.